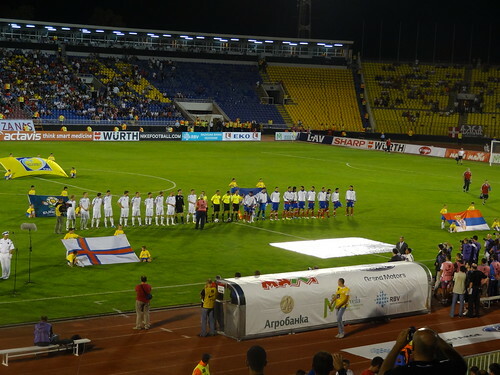 Tuesday evening I attended the Serbia versus Faroe Islands European Cup Qualifying Match. Serbia is in Group C and is trying to qualify for this summer’s European Cup hosted by Poland and Ukraine. With a 3-1 defeat of the Faroe Islands, they move into second place in the group. Italy, the first place team in the group, are 8 points clear and guaranteed a spot. The second place team in the group earns a spot in a play-in round against another second place club in one of the nine groups, or if they have one of the best records for a second place team, they earn an automatic bid. The second place spot in Serbia’s Group C is tightly contested. The good thing is Serbia controls their own fate. The other two teams behind Serbia (14 points) are Estonia (13 points) and Slovenia (11 points). Let’s break down Serbia’s chances of winning the second place position. Serbia has two games left while the other two only have one game remaining. Serbia is hosting Italy and traveling to Slovenia next month. How they need to do depends on Estonia. Estonia travels to Northern Ireland. Let’s say Estonia wins the game in Belfast to finish the group with 16 points. That would mean that Serbia needs win at least one of the games to qualify. Both matches will be difficult. The Italians will be coming with a second-rate team because they have already qualified. It will be an emotionally-charged game. Last fall, Italy was granted a 3-0 forfeit over Serbia because the game could not be played due to a few hooligans in and out of the stadium. The match in Slovenia will not be easy either. All of the ex-Yugoslavian Derby matches are hard fought, and Slovenia has a decent team as evidenced by their qualification in the last World Cup. We really enjoyed the game. Because no one expected the Faroe Islands to win, the stadium was only about half full and we had excellent, comfortable seats. It is a joke that the Faroe Islands can compete as an independent nation. They are located half-way between Scotland and Iceland and have a population of around 50,000. We were joking that the balding, slightly overweight striker, took a couple days off postal duties to play in the game. I have to give the Faroe Islands team credit however. They gave a good effort, scored a goal, and they even had a cheering section behind us. Normally, young men in the Serbian crowd would look menacingly at the opposing cheering section, but because of the quirkiness and small size of the contingent, they were more laughing and staring as anything. The group has an odd chant as the their team approached the goal or had a corner kick. 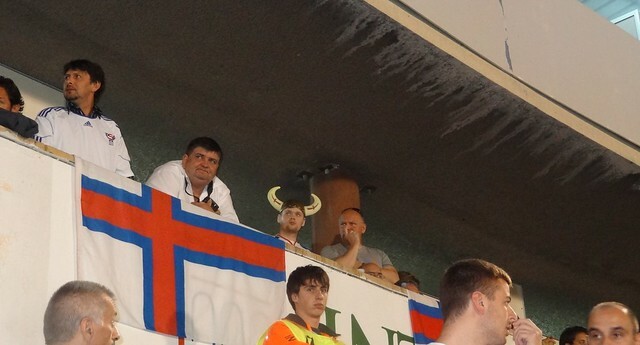 They even had one guy with a Viking helmet in Faroe Island colors. (see below) They even have earned 4 points in the group with a win over Estonia, which could ultimately determine Serbia’s fate. It would be great for the “Orlovi” (Eagles as the Serbian team is nicknamed) to qualify. They had a tumultuous group stage with a coaching change, and a forfeit in Italy which also resulted in a home game against Northern Ireland in an empty stadium. It is nice for once for Serbia to control their own destiny in trying to get into a European event. This is much different than their attempts to get into the EU. Go Serbia! Navije Srbija!